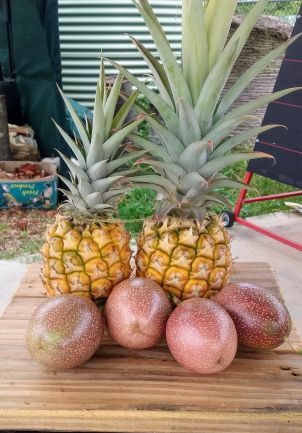 Welcome to the JCU Cairns Community Garden webpage. Here you will find all the information you need about the garden and how you can get involved. To stay up to date with what is happening at the garden, including upcoming events, join the Community of Gardeners Facebook page, or sign up to receive our regular ebulletins - email sustainability@jcu.edu.au to subscribe. Please note that all visitors to the garden must wear enclosed shoes. BYO hat, long sleeve shirt, sun-screen, insect repellent and water. Thank you to Djabugay Traditional Owners for giving our garden its language name, ‘Mayi Tjulbin Ma Bugarra'. The name means food and fruits, vegetables, trees and berries from the rainforest and covers all the clans of the Djabugay Nation. 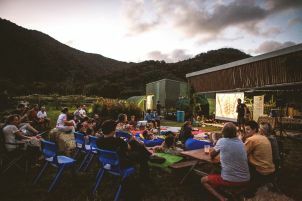 Anyone wishing to become a member of the JCU Cairns Community Garden or volunteer at the garden site must first participate in a Community Garden Induction. The induction is a compulsory briefing session, introducing gardeners to the site including operational requirements and the responsibilities of all garden users. Please email sustainability@jcu.edu.au to organise a time for your induction. There are many ways that you can get involved in our garden. We hold regular events at the garden throughout semester time. Come and join us at one of our workshops, planting days, BBQs, picnics, harvest parties or film nights. Events at the garden are a great way to meet new people and have fun. 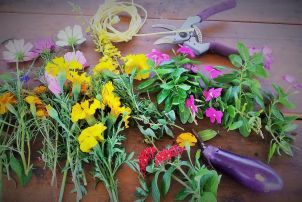 Check out the Community of Gardeners Facebook page to find out what's coming up. Or maybe you would like to host your own event at the garden? Contact sustainability@jcu.edu.au if you would like to organise an event. Once you have been inducted to the site, you can just come to the garden at any time and garden at your leisure. The induction is a compulsory briefing session for all new volunteers, introducing gardeners to the site including operational requirements and responsibilities. Email sustainability@jcu.edu.au to book your induction. 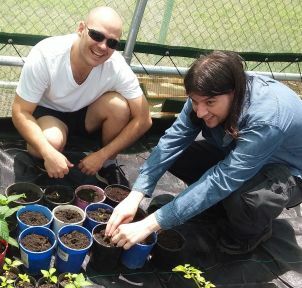 You can become a member of the Community of Gardeners Club, a JCU Student Association affiliated Club. Contact the Club at jcucommunitygarden@gmail.com to find out more. Our community garden is located at JCU's Cairns Campus at Smithfield - please see our campus map for exact location. Check out our beautiful Community Garden Planting Guide! This was put together by Jay Jackson, our amazing Garden Coordinator, and informed by past and present students and staff, and members of the Cairns community. Community garden members can use this diagram to guide their individual and / or group garden activities including sourcing stock, seed collection and propagation, and planting out the garden. The Planting Guide is a living document that will be updated as our community garden evolves. We’d love to hear your feedback and ideas – email sustainability@jcu.edu.au. 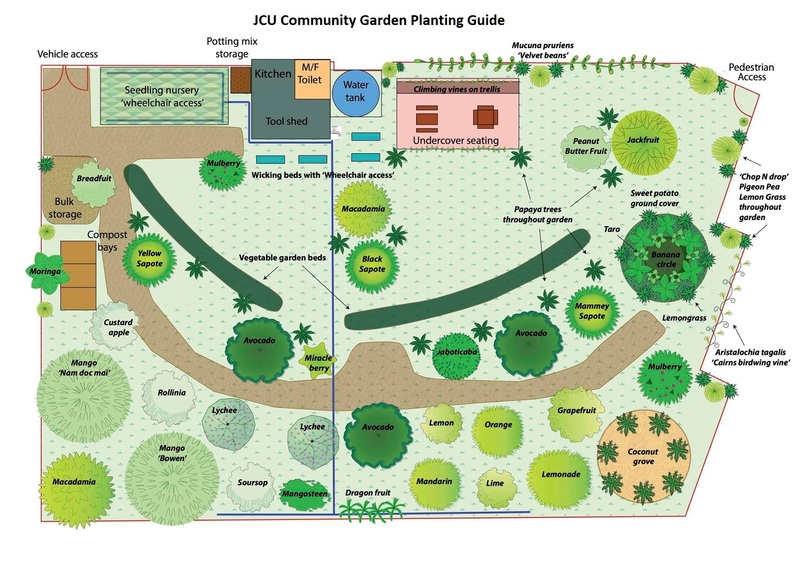 The JCU Cairns Community Garden is governed by the Community Garden Working Group. The purpose of the Working Group is to report and provide recommendations to the Dean of Research Infrastructure, who is responsible for the Environmental Research Complex (ERC) where the garden is located. a representative of the Community of Gardeners Club (a JCU Student Association affiliated Club). Provide a community inclusive garden facility within the JCU governance structure. Provide advice on the strategic development and long-term management of the garden. Oversee the ongoing maintenance and upkeep of the garden. Foster awareness and involvement by the campus and Cairns community. Ensure effective feedback and communication between the Working Group, garden stakeholders and JCU decision makers. 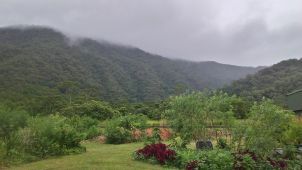 The James Cook University (JCU) Cairns Community Garden Operational Guidelines provide an overarching guide for the responsible management and use of the Community Garden located at JCU’s Cairns Campus. The Guidelines are a working draft document that will be updated on a regular basis as required. All site users must comply with the rules, procedures and processes outlined in the JCU Cairns Community Garden Operational Guidelines, including the Community Garden Code of Conduct. Access to the Community Garden is restricted to official Opening Times. The Garden will generally be unsupervised, including during official Opening Times; children must be accompanied by a responsible adult at all times. Events must be pre-approved by the Community Garden Working Group, including provisions for the consumption of alcohol at the garden. The consumption of alcohol at the Garden is only allowed during approved events and must adhere to the JCU Consumption of Alcohol on University Property policy and procedure. See webpage for information and application form. Unauthorised animals are not allowed on site. This rule does not apply to Guide, Hearing and Assistance Dogs as defined under the Guide, Hearing and Assistance Dogs Act 2009. Unauthorised activities such as parties or sleep-outs are not allowed. I will behave in a way that aligns with the garden objectives and values. The garden is a shared community space; I will respect the rights and opportunities of all other users of the space. Members are not to make key garden decisions on their own but will run major ideas and plans by the Community Garden Working Group. I will dispose of my waste appropriately to help keep the garden clean and presentable. No smoking in our garden. The consumption of alcohol in the garden is only allowed during approved events and must adhere to the JCU Consumption of Alcohol on University Property policy and procedure, including application process. If a dispute arises, I will settle it through calm discussion and if needed seek facilitation and support. I will always be aware of the safety of others and myself.